remote news photographer. life on the road, an office at 30K ft.
Efrem Graham does a news stand up in the Outer Banks the morning after Hurricane Earl rolls through. I’ve never been in a hurricane before. 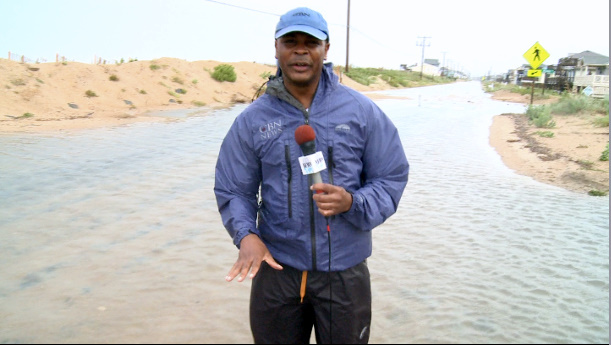 The closest I’ve been to experiencing one was last year this time while covering a tropical storm that formed over Virginia Beach. We dealt with flooded homes, stranded cars, downed power lines, that sort of thing. I remember in amazement the water level at my door step, watching it slosh up and over the curb. I remember barely getting to work in my gray Sonata, worried that the flooded streets would hurt my engine. Going into Hurricane Earl I didn’t know what to expect. That was a tropical storm, this was a hurricane. They call this type of thing storm chasing. In reality though, it would be more accurate to call it storm waiting. Our crew (a reporter and two photographers including myself) picked a hotel that was dead center in the path of Earl. The hotel was glad to reserve us three rooms, as they had a lot of people canceling weekend plans anyway. We rented a silver Jeep Commander, refused the insurance (as we were told to do, but later realized we should have), loaded it with camera gear and supplies, and made the two hour drive south the Outer Banks of North Carolina. Unloading at the hotel and prepping our gear for the night, we watched people trickle out of town, like something out of a Hollywood end of the world flick. The skies were fairly calm, no rain, and the people brave enough to stay were expressionless as they nailed boards over their windows. I felt a little nervous, like I should be leaving with everyone else: leaving the quiet. 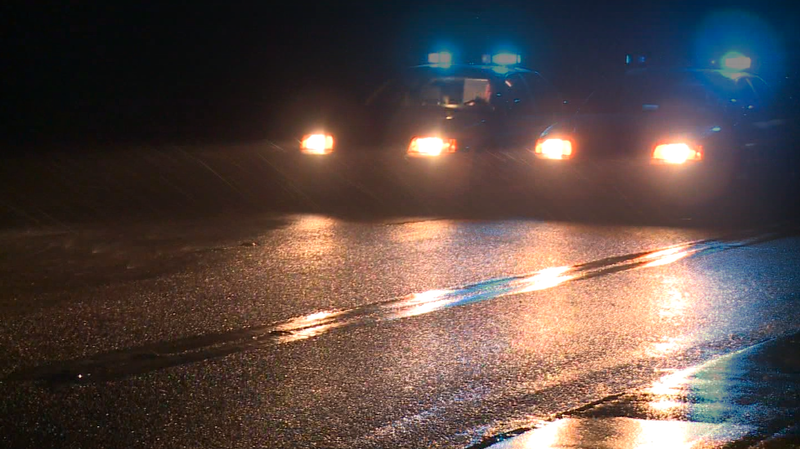 State Troopers block off the highway leading into Cape Hatteras. As night fell and the eye of the Earl got closer, we decided to drive to a remote part of the northern coast of NC: Hatteras Village. Hatteras was evacuated the day before as meteorologists predicted that the eye would pass only twenty-sixty miles off its coast. State troopers had blocked off the thin strip of road that led its way into Hatters, stopping residents from getting back in. After showing press passes the police let us through, but not before a weird “good luck” and half smile from the officers. Pretty soon we got our Earl. The change was gradual, and hard to notice, and felt as if one minute we were dry and the wind was calm, and the next horizontal sheets of rain-sand (what I call rain and sand traveling together at the same speed) was sandblasting our car and the houses around us. Quick sound with Jim Cantore of the Weather Channel. We hung out with the WC crew in Hatteras Village for a hour or so during the storm. 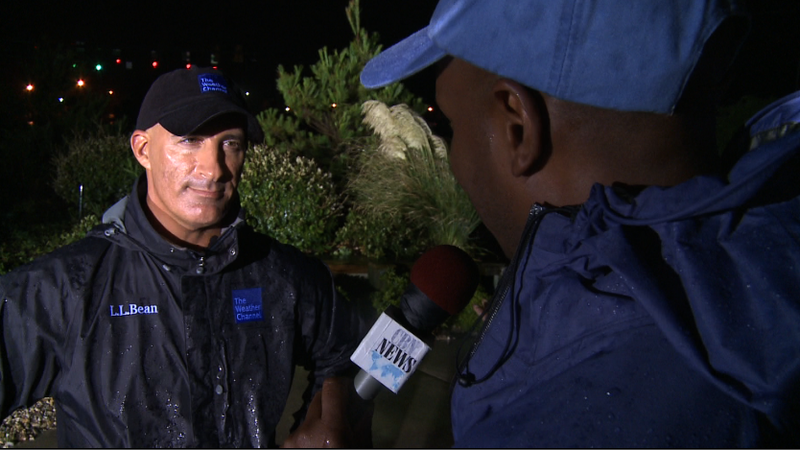 Jim Cantore and his Weather Channel crew were the only ones still on the island. We hung out with the crew for a little while, traded stories, and watched Jim Cantore do quick throws for NBC and the Weather Channel. We shot a quick interview with Jim, thanked the WC crew, and headed out again into Earl. We beat the storm back to Kity Hawk, grabbed a midnight sandwich and soda from 7-11, thanked the poor wide-eyed manager that decided to stay open (his windows were boarded double-thick), and headed further north towards Avalon Pier, in Kity Hawk, NC. Face red from the sand-rain, camera covered in sand and water, I helped Efrem off the beach and we pressed against the wind, carefully making our way back towards the Jeep. It was 3AM, and we had now shot enough footage to edit a piece for our morning news program. We raced north towards the hotel, as we only had a few hours until the package had to be FTP’d (online video transfer via servers) to our studios in Virginia Beach. We pulled up to the hotel overhang to see pieces of siding flying off the hotel’s walls. With big bangs they fell into the courtyard and the parking lot. For the next three hours I edited in my room, listened to the storm bend our balcony windows, and jumped a little when a new piece of hotel siding fell into the courtyard. Sunrise was hard to spot because of the clouds, wind, rain still pounding the area. I was able to upload the story in time for its air date, a huge relief. But we still had to shoot another package for our afternoon and evening news broadcasts. We got to it, fighting the rain and wind, shooting more footage, live Skype shots, more stand ups, and more interviews with those who stayed. We had been awake now for about 35 hours, and we were exhausted from fighting the storm all night and morning. At around 9:30AM we pulled up to the hotel to exchange some gear and get a fresh laptop, when James, a most veteran news photographer, did something he was warning about the whole trip. To preface though, being in a hurricane requires paying attention to little details. How low are the phone cables that snapped and now dip into the street? Which direction is the wind? How much sea foam is on the road (pre-cursor to flooding)? How much ground clearance does our Jeep have? Answers to these questions, and the observations that get get us those answers are crucial to our safety and our effectiveness as visual journalists. That said, opening car doors during a hurricane can be destructive to the vehicle if the car is parked the wrong way in the wind. If the door is opening with the wind it can literally be thrown off the car. We had parked next to a hotel wall, but didn’t account for the wind bouncing off the wall and hitting the Jeep the wrong way. Instead of the wind pushing the door closed (which is preferable), the wind was throwing itself with the door, and as soon as James opened the door it flew open suddenly, snapping a giant spring and throwing the driver’s side door all the way forward into the front hood. I wish I had a picture to put on here, but I was so tired and shocked at this point I didn’t really react other than laugh. We forced the door to close and continued on our way. 39 hours after it all began, finally, we finished our last story for the afternoon news show Newswatch and sleep-collapsed. Below is a compilation piece I made that includes bits from all three packages we shot and edited. It’s a little long, longer than the pieces we aired, but its fun to watch. The whole thing was definitely an experience, learning about shooting in such an extreme environment. Efrem Graham, our reporter, did an absolutely phenomenal job on the spot, and photographer James Lea was cool and calm and experienced in even the most stressful of situations. And Hurricane Earl didn’t reek too much havoc, except on our Jeep Commander. But seeing everything we did that night and next day, and all the chaos, I’m glad that’s the worst of it. And don’t tell my girlfriend: I caught a bit of the storm-chasing bug. Well, the storm-waiting bug at least. Article first published as Jim Cantore, Hurricane Earl, and the Storm-Waiting Bug on Blogcritics. This entry was posted in behind a camera, CBN, Disaster, National News, Photography, Weather and tagged behind a camera, behindacamera, blog critics, blogcritics, buxton, cape hatteras, CBN, CBN News, christian news, disaster, earl, hurricane coverage, hurricane earl, NC, north carolina, outer banks, photographer, ryan johnson, ryan johnson blogger by Ryan Johnson. Bookmark the permalink. Ryan Johnson is a 25 year old remote disaster and humanitarian photographer and media liaison working for an international non-profit. Ryan has a B.S. in Radio/TV/Film and Religion and an M.A. in International Politics.